The first time I saw Pacific Northwest Ballet perform William Forsythe’s “One Flat Thing, reproduced,” in 2008, my head exploded in the most wonderful way. I’d loved Forsythe’s “In the middle, somewhat elevated,” already part of the PNB repertoire, but “One Flat Thing,” with Thom Willems’ arresting electronic score and its flotilla of white-topped tables that served as both set, obstacles, and dance partners? This was a ballet that spoke to my soul. Ten years later, PNB presents the dance again, as the capstone to the annual “Director’s Choice” program. And “One Flat Thing” is better than I remembered it. If you haven’t had an opportunity to see it, this is a work for 14 dancers and, 20 metal tables. As the lights come up, the dancers emerge from darkness at the back of the stage, each dragging out a table, which they align precisely, like cars in neat parking spaces. Then, to Willems’ sometimes jarring score, we watch the interplay between the humans onstage, as well as the interplay between humans and their environment; in this case---the tables. On opening night, March 16th, Christian Poppe began the action with an emphatic hop straight up from the floor to a set on a table top; Noelani Pantastico seized the stage, striding toward us between two rows of tables, her hands grazing their surfaces, her ponytail sailing in her wake. Ryan Cardea teasingly echoed the movements of his fellow cast members; Kyle Davis stepped in to help a dancer reposition her legs, while Lucien Postelwaite lay under a table, his movements shadowing the action above him. “One Flat Thing, reproduced” was inspired by Robert Scott’s Antarctic expeditions, according to the program, and if you’re inclined toward literalism, you can see icebergs in those white table tops. Ten years ago, this ballet made me thing about chaos and order; this time around I saw it as a thrilling wild ride that showcases each dancer’s technical abilities and full-on commitment to this multi-faceted, and continually fascinating, work. As I mentioned, “One Flat Thing” capped an excellent evening of contemporary work that opened with the premiere of PNB soloist Ezra Thomson’s ambitious and sophisticated “The Perpetual State.” I’ll write more about it after a second viewing. Karel Cruz and Laura Tisserand were sinuous and elegant in Forsythe’s “Slingerland Duet.” PNB audiences originally saw this in 2015 as part of another work called “New Suite.” Forsythe removed this long duet, and now it stands on its own in the PNB rep, like a polished jewel. “Slingerland” was paired mid-evening with Ulysses Dove’s 1994 quartet “Red Angels,” performed to Mary Rowell’s percussive, plaintive electric violin. I have loved “Red Angels” since the first time I saw it at PNB in 2005. The opening night cast--Lindsi Dec, Lucien Postelwaite, Lesley Rausch and Jerome Tisserand--were uniformly excellent, but I have to single out Postelwaite, who took my breath away. He has a seemingly magical ability to hang in mid-air for an extra beat, when you’d think gravity would pull him to the stage. It’s a haunting contrast to Rowell’s throbbing and somewhat ragged violin. PNB Principal Dancers Lucien Postelwaite and Lesley Rausch in Ulysses Dove's "Red Angels"
Actually, it feels a little unfair to single out dancers, because the company as a whole looks so good right now. 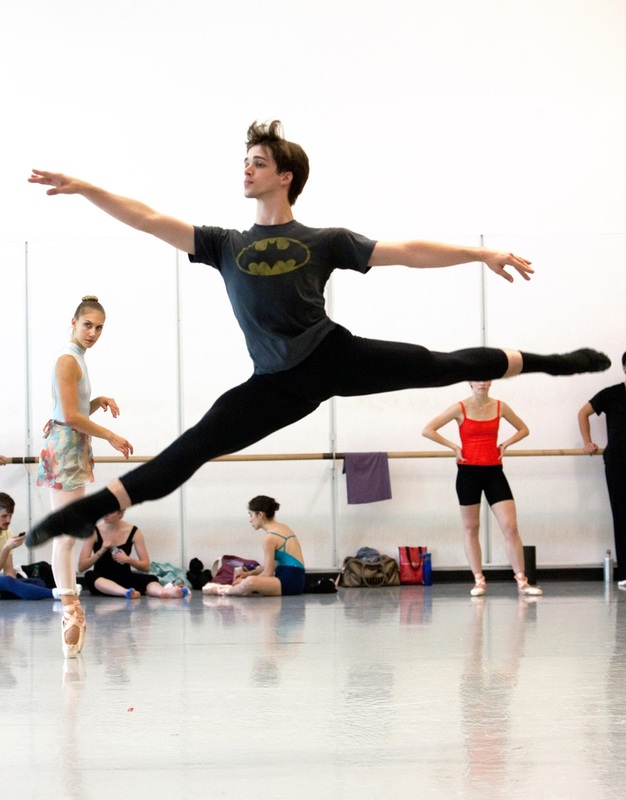 Artistic Director Peter Boal regularly pulls out members of his corps de ballet, to feature them in roles that typically go to soloists or principal dancers. At this performance, he took the opportunity to promote two of those corps members: Price Suddarth and Steven Loch. Both promotions are well-deserved, but Boal could just as easily promote at least half a dozen others: Emma Love Suddarth (Price’s wife); Sarah Pasch; Elle Macy; Miles Pertl; Dylan Wald to name just a few of the excellent company members who deliver great performances night after night. If you’ve been meaning to check out PNB, now is the time. The company is preparing for its first-ever tour to Paris, plus the work on offer is exciting. “Director’s Choice” runs Thursday through Sunday at McCaw Hall. Go! You won't be disappointed.